When teen photographer Ella Kerrisk declares on her website that she gladly takes on “any challenges,” it’s not just bravado. The 16-year-old homeschooler has the credentials to back up her claim. Whether through family interaction, academics or community service, she has channeled a variety of experiences into honing the skill she treasures. Need a portrait of an “uneasy toddler” or “family members who hate having their pictures taken?” No problem. Want to record nature’s beauty? Ella does that. Need a sports event covered? Ella does that, too, mostly as a freelancer for an Atlanta-based studio. She also photographs events at her church and teaches photography to kids in grades 4-6 through her local 4-H club. Ella’s unique selling point, though, is in an area she says few other photographers claim as a focus—taking portraits of children with special needs. She advertises the service on her website, referencing her history of interacting with children whom some may consider unusual. It started with a younger sibling who has autism and epilepsy. She said she’s especially proud of a portrait session she did of a boy with autism. To keep him engaged, she held his hand during the entire photo shoot, which “made it hard to change the settings” on her camera—but the results were worth the effort. She said she remembers taking photographs with her parents’ point-and-shoot camera as early as age 5, and then upgrading to a Canon Rebel by her early teens. But it was the gift of a professional-grade camera from her grandmother, and her mother’s insistence that she study at the University of North Georgia, that encouraged Ella to take her hobby to the next level. Heather remarked that encouraging her children simply stems from the reasons she and her husband decided to homeschool even before Ella—their oldest child—was born. For Ella, that encouragement constantly led her to seek additional responsibility—and opportunity. She started with photographing flowers, then progressed to people. “I had a lot of friends who needed photos, so I started with them,” Ella said. Taking photographs for a wedding gave her the confidence (and the portfolio) to start advertising her services. It also helped that being home-educated provided her with a flexible schedule. 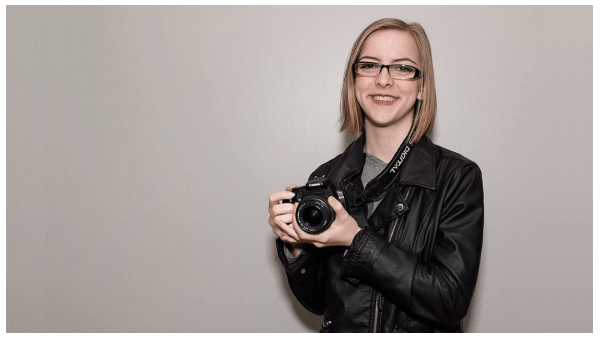 For now, Ella is a straight-A student at Lanier Technical College where she’s studying graphic design and looking for even more photography work. Immediate possibilities include photographing student life for the college and taking portraits of dogs and cats that are up for adoption through a local animal shelter. Her long-term plans are even more ambitious. “My end goal,” said Ella, “is to be a stay-at-home mom while doing all this.” That is, she hopes to market her services as a professional photographer and graphic designer while overseeing the education and development of her own children. It doesn’t sound far-fetched to Heather, who is setting an example by raising a diverse bunch of kids herself. These range from a frenetic 5-year-old boy, the youngest of three brothers, to Ella’s younger sister, who is overcoming epilepsy and blossoming into a musician. This article was originally published on February 27, 2018 at https://blog.hslda.org/2018/02/27/professional-photographer-at-16-homeschooled-you-bet. Used with permission. Image Credit: Photo courtesy of Lanier Technical College via Facebook. Whilst youngster photographer Ella Kerrisk proclaims on her internet site that she gladly takes on “any challenges,” it’s not just bravado. The 16-yr-vintage homeschooler has the credentials to again up her declare. Whether or not through the circle of relative’s interaction, academics or community provider, she has channelled a ramification of studies into honing the ability she treasures.